Wyclef Jean, Bruce Springsteen, Jennifer Hudson, Mary J. Blige, Shakira, and Sting will Appear in New York City; Alicia Keys, Christina Aguilera, Dave Matthews, John Legend, Justin Timberlake, Stevie Wonder, Taylor Swift, and a Group Performance by Keith Urban, Kid Rock, and Sheryl Crow in Los Angeles; Coldplay, and a Group Performance by Bono, The Edge, Jay-Z, and Rihanna in London. All Performances to be Available for Purchase from Apple iTunes Store with Proceeds Benefiting Select Haiti Relief Funds. More than One Hundred of the Biggest Names in Film, Television, and Music to Appear on "Hope for Haiti Now," Along with Wyclef Jean in New York City, George Clooney in Los Angeles, and CNN's Anderson Cooper in Haiti. Additional Television, Online, and Mobile Partners Make "Hope for Haiti Now" the Most Widely Distributed Global Telethon in History. "Hope for Haiti Now: A Global Benefit for Earthquake Relief," today announced its lineup of superstar musical performances. The global telethon will feature performances by Wyclef Jean, Bruce Springsteen, Jennifer Hudson, Mary J. Blige, Shakira, and Sting in New York City; Alicia Keys, Christina Aguilera, Dave Matthews, John Legend, Justin Timberlake, Stevie Wonder, Taylor Swift and a group performance by Keith Urban, Kid Rock, and Sheryl Crow in Los Angeles; and Coldplay, and a group performance by Bono, The Edge, Jay-Z, and Rihanna in a newly added London location. All musical performances will be available for purchase for $.99 per song through the Apple iTunes Store beginning Saturday, January 23, with all proceeds benefiting Haiti relief funds managed by "Hope for Haiti Now" charities. In addition to musical performances, Wyclef Jean in New York City, George Clooney in Los Angeles, and CNN's Anderson Cooper reporting from Haiti, "Hope for Haiti Now" will feature more than one hundred of the biggest names in film, television, and music supporting the cause with testimonials and by answering phones during the telethon. The Clinton Bush Haiti Fund and United Nations World Food Programme have joined the list of relief organizations that will benefit from "Hope for Haiti Now," which also includes Oxfam America, Partners in Health, the Red Cross, UNICEF, and Yele Haiti Foundation. Proceeds from "Hope for Haiti Now" will be split evenly among each organization's individual funds for Haiti earthquake relief. "Hope for Haiti Now" will be the most widely distributed telethon in history, both internationally and across media platforms. The two-hour telethon will air on ABC, CBS, NBC, FOX, CNN, BET, The CW, HBO, MTV, VH1, and CMT on Friday, January 22, 2010 at 8:00 p.m. ET/PT and 7:00 p.m. CT. "Hope for Haiti Now" will also air on newly added networks including PBS, TNT, Showtime, COMEDY CENTRAL, Bravo, E! Entertainment, National Geographic Channel, Oxygen, G4, CENTRIC, Current TV, Fuse, MLB Network, EPIX, Palladia, SoapNet, Style, Discovery Health, Planet Green, and Canadian networks including CBC Television, CTV, Global Television, and MuchMusic. The event will be live streamed online globally across sites including YouTube, Hulu, MySpace, Fancast, AOL, MSN.com, Yahoo, Bing.com, BET.com, CNN.com, MTV.com, VH1.com, and Rhapsody and on mobile via Alltel, AT&T, Sprint, Verizon, and FloTV. "Hope for Haiti Now" will also air internationally on BET International, CNN International, National Geographic, and MTV Networks International, which is available in 640 million homes worldwide. 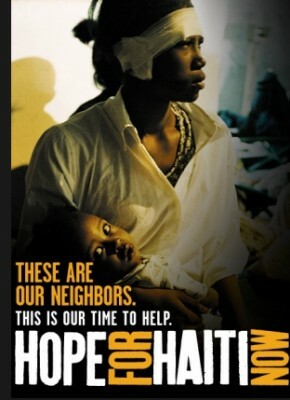 "Hope for Haiti Now" will be the first U.S.-based telethon airing on MTV in China. Facebook and Twitter have signed on as official social media partners to help drive donations and tune-in to the telethon. Based on production needs and venue sizes, all "Hope for Haiti Now" studio locations will be closed to the media. Photos, pool video footage and talent interviews from "Hope for Haiti Now" will be serviced to news outlets immediately following the event. "Hope for Haiti Now" is produced by Joel Gallen and Tenth Planet Productions, in collaboration with Viacom's MTV Networks and George Clooney. MTV Networks, a division of Viacom (NYSE: VIA, VIA.B), is one of the world's leading creators of entertainment content, with brands that engage and connect diverse audiences across television, online, mobile, games, virtual worlds and consumer products. The company's portfolio spans more than 150 television channels and 400 digital media properties worldwide, and includes MTV, VH1, CMT, Logo, Harmonix, Nickelodeon, Nick at Nite, Nick Jr., TeenNick, AddictingGames, Neopets, COMEDY CENTRAL, SPIKE, TV Land, Atom, GameTrailers, and Xfire.